The Arcade is a minigame area in Mario & Luigi: Paper Jam. 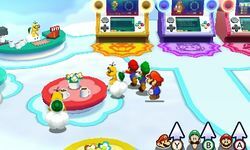 Located in the clouds above any Lakitu Info Center in the game, it's accessible via a green pipe to the left of the entrance and hosts the Battle Ring, Papercraft Battle Ring and Attackathon machines, which let players replay boss battles, Papercraft battles and play the Bros. Attack endurance minigames, respectively. However, the Arcade can only be accessed after going to Sunbeam Plains for the second time. The bros can also buy Lakitea for 20 coins from the nearby shopkeeper. This will fully heal all members of the party. Just like The Gauntlet from Mario & Luigi: Bowser's Inside Story and the Battle Ring from Mario & Luigi: Dream Team, the Boss Battle Ring lets players refight tougher versions of bosses defeated earlier in the game. When battling a boss in the Boss Battle Ring, the player will get given a limited amount of items, which will lower their final score if used. They can choose their Battle Card deck like normal, but they will only start with 10 Star Points. Finally, both Assist Mode and Easy Mode aren't usable in the Boss Battle Ring, and will be automatically disabled when a battle starts. Similar to the Mad Skillathon in the previous game, the Attackathon is a series of Bros. Attack endurance minigames. Unlike in the previous two games, however, there are no prizes to be gained from the minigames themselves. Instead, the game's Expert Challenges system has challenges set for getting A and S ranks in each of the Attackathon minigames, with the points being used to buy gear from the Expert Challenges/points shop. Note: Mega Thwonk is listed before Toad Trail in the Challenges list, but after it in the Attackathon select menu. There is also a C ranking (if the player gets between 0 and 999 points) and a B ranking (between 1000 and 1999 points), but neither award Challenge points. Like the Giant Battle Ring in the previous game, the Papercraft Battle Ring lets the player replay any papercraft battles these beaten across the course of the game. Morton, Iggy, Lemmy, Bowser, his paper counterpart and Shiny RoboBowser are the only bosses not fought in the Boss Battle Ring. However, Wendy, Roy, Larry and Ludwig appear in Dry Bowser's boss battle, albeit without their usual gimmicks. All of the arcade machines resemble the Nintendo 3DS and the New Nintendo 3DS. This page was last edited on March 23, 2018, at 10:26.